During March, up until March 17, in Branson, Missouri, my favourite museum built in the shape of a half-scale liner in collision with an iceberg, is honoring 121 Irish people. Not just any 121 Irish people of course, but the ones who boarded the Titanic on April 11, 1912. That’s 3 in first class, five in second class, and 113 who paid for the Celtic Cruise package to listen to Gaelic Storm. 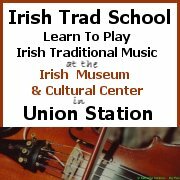 Throughout the museum cast members will tell Irish stories, and music and dancing will also be part of the celebration. Dirty Old Towne is “a Celtic inspired band, drawing from Traditional Irish, Acoustic Folk, and Modern Rock sounds”, and they’ll be performing on March 9, 10, 11 and 15, 16 from Noon to 4:00pm. Reading between the lines, you get to hear just some of Dirty Old Towne in the Titanic museum, as the museum website says “All of the band can be heard at Waxy O’Shea’s Irish Pub in Branson Landing”. The Titanic performances will be focused on the traditional musical styles of Irish immigrants at the turn of the century. There’s also an appearance by the Celtic Fire Irish Dance Co. as they perform both traditional and contemporary Irish soft shoe dances, on Saturday, March 10, from 11:00am to 1:00pm. It’s probably too risky for the hard-shoe dances, what with the iceberg and all. And then at the end of it all, you get to find out if the 121 Irish people being honoured, lived or died. Every museum should do this. Think of the attraction in Kansas City if your admittance ticket to the new World War I museum was in the name of an actual soldier in the trenches. You could root for your boy throughout your visit before at the end being told if you drew shell fire, gangrene, dysentery, mustard gas, or a plain old gun shot. This entry was posted on Tuesday, March 6th, 2007 at 4:05 pm and is filed under Branson, Events, Gaelic Storm, History, Waxy O'Shea's. You can follow responses via my RSS 2.0 feed. Both comments and pings are currently closed.